May took us to All Saints at Old Heathfield.-A beautiful 13C Church tucked away in the heart of a small old village. This Church hosts many stained glass windows but one in particular, commemorates the foundation of the first settlement at Jamestown in Virginia USA in 1607. The bell-chamber of the tower (which, a few of our fitter members, climbed) has the date 1445 carved into it. The nearby 14th Century Star Inn served to be a rather convenient watering hole. 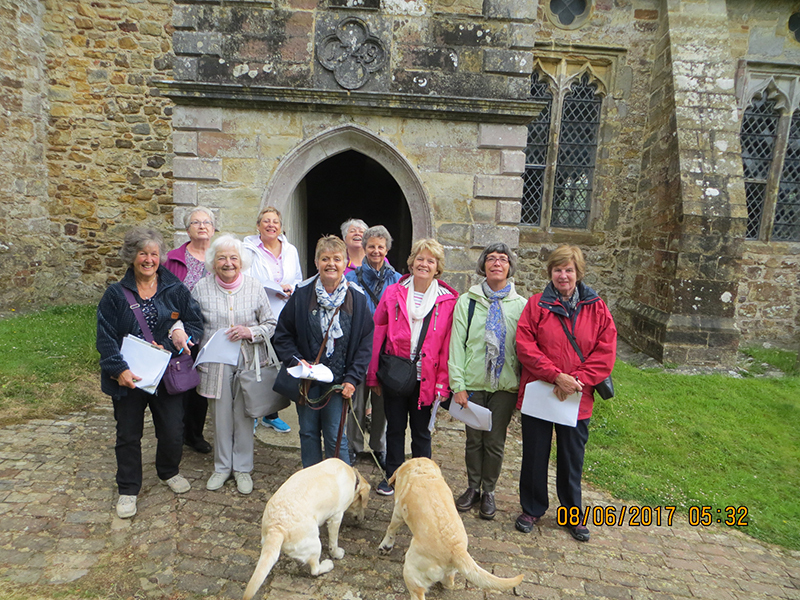 In June, we visited St Thomas a Becket at Brightling. Views of this church from the road entice the traveler in. Step up the worn stairs of the gateway and you are confronted by a pyramid in the graveyard, that of Mad Jack Fuller. The church itself is quaint and full of history snippets but the best of all is the barrel organ. Dear reader, I urge you - go and look for yourself, you won’t be disappointed. We still have vacancies for members, so if you are interested click on the Dove to email the group organiser.